Microsoft Kaizala, the app that was initially developed as a project by the Microsoft Garage team from India, is now rolling out to all eligible Microsoft 365 and Office 365 customers worldwide. The Redmond giant is also in plans to ultimately integrate the productivity app within Microsoft Teams. The Kaizala app is also getting new capabilities, including @mentions and the option to delete messages, to set the stage for the new integration. To recall, Microsoft launched the Kaizala app initially in India back in November 2017 and subsequently rolled it out to other markets. The app was up until available for Android and iPhone devices, though the latest announcement has brought its presence to PCs as well. With Kaizala debuting on Microsoft 365, enterprises will able to enable communication with various groups, including contract workers, vendors, partners, suppliers, and customers. The app enables phone number-based identity to help firstline workers communicate with their organisations. Also, Microsoft has a “Pro” version of the app to let enterprise customers create and manage organisational groups as well as monitor rich analytics, and create custom integrations and workflows. The Kaizala Pro app has particularly debuted on Office 365 with no additional fee. The app through its arrival on Microsoft 365 and Office 365 is reaching 40 languages and over 180 markets globally through the new move. 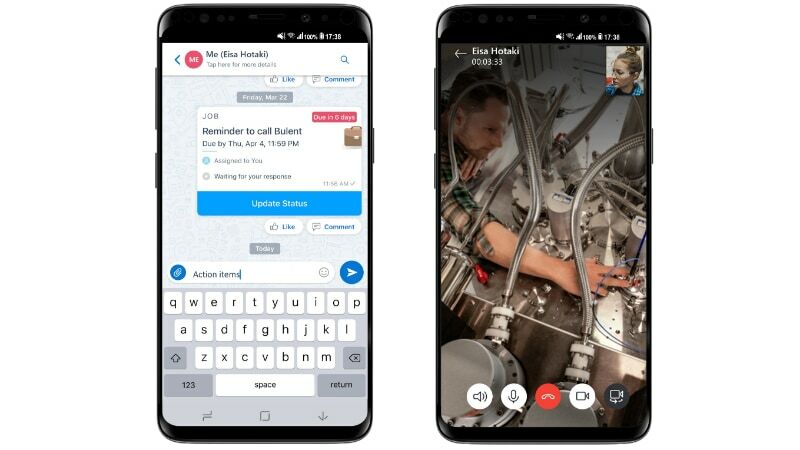 Alongside making its way to Microsoft 365 and Office 365, Microsoft has revealed its intention to integrate the Kaizala app within Microsoft Teams. “The capabilities of Kaizala complement the robust communication and collaboration capabilities of Microsoft Teams, the hub for teamwork in Microsoft 365,” the company said in a statement. The integration is expected to happen in phases over the next 12-18 months. But initially, Microsoft is introducing new capabilities in the Kaizala app. The company is adding @mentions as one of the new features to let users easily tag individual members in a chat to call their attention to a message. Similarly, the app has received an option to delete a message in a 1:1 or group chat within an hour of sending it. Group admins have also been empowered with the ability to delete any message at any point in time. Microsoft is also adding image annotation to offer a rich inking experience. Also, the Kaizala app is getting a video calling feature. There is additionally the new Kaizala me private chat space that lets users send chat messages, such as meeting notes or reminders. The feature also comes with action cards. All this reminds us of Microsoft Teams arch-rival Slack that has provided a similar list of features for some time. For desktop users, the Kaizala Web app has options to access and search chat conversations, send documents, and action cards. The app is currently in public preview, though it will be generally available to all Kaizala users later this quarter. Microsoft has also updated the Kaizala Management Portal and enabled in-region data residency for new customers. The company notably has the latter facility in the US, APAC, India, and Europe. Going forward, the Microsoft Kaizala app is set to add other new capabilities as well. The company has plans to bring support for right-to-left languages such as Hebrew and Arabic, ability to invite users through emails, and sync Azure Active Directory (AAD). There will also be a new admin role to help dedicated admins manage Kaizala policies. The planned changes are essential since the Kaizala app is now becoming a worldwide productivity tool. Currently, organisations such as Apollo Hospitals, Government of Andhra Pradesh, M-Kopa Solar, and Philippines Airlines are using the app. Just earlier this week, Microsoft announced that it would deploy the Kaizala app to connect three crore employees of Indian Railways with healthcare facilities.